Egypt's foreign ministry said it is following with great concern the repercussions of a militant attack by Houthi forces on a Saudi warship off the western coast of Yemen which it said would have an impact on the security of navigation in the Red Sea. Houthi militants launched an attack Monday from three suicide boats on a Saudi frigate west of Hodeidah port, killing two Saudi naval forces sailors. In a statement late on Wednesday, the ministry said the "vicious" attack "threatens efforts to transfer humanitarian aid and relief supplies" to Yemeni citizens and poses a threat to "navigation security in the Red Sea." The ministry added that Egypt strongly condemns the assault which reflects a "continuous policy of destabilizing the region." The attack was claimed by the Iran-allied Houthi group that controls Yemen's capital city, Sana’a. A Saudi-led coalition of the Kingdom's Gulf Arab allies have been carrying out thousands of bombing raids in Yemen since March 2015 in an attempt to restore the ousted, internationally recognized government of President Abd-Rabbu Mansour Hadi. 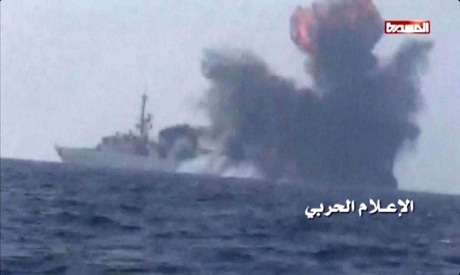 The coalition has said the attack on the ship was a serious development that "would impact international navigation and the flow of humanitarian assistance to the port for Yemeni citizens."